Pentridge Prison operated in Coburg between 1850 and 1997 and as in all prisons some prisoners were also artists (not just escape artists and bareknuckle bash artists). In 1886 professional photographer, Joseph H. Soden was convicted of forging pound notes and served time in Pentridge in the same year his photographs were exhibited at the Melbourne Intercolonial Exhibition. In 1960 (or 1962 or1964) aboriginal artist Elliot Ronald Bull (1942-1979) painted the mural in “F” Division. Painted with ordinary house paint the mural depicts an aboriginal camp scene. Part of the stolen generation Elliot Ronald Bull had already studied painting with Melbourne painter, Ernest Buckmaster. After his release Elliot Ronald Bull participated in a number of solo and group exhibitions. Some of his mural at Pentridge has been preserved. Having lived in Coburg for decades I can remember the prison in operation, closed the location being slowly rehabilitated. I can still remember hearing the howls that came from Pentridge at midnight on New Year’s Eve in 1991 when I was living a block from the prison walls. I also saw and photographed parts of the prison shortly after it closed. Carving from officers club rooms Pentridge Prison. There was some prisoner art on the site in the maximum security Jika Jika Unit and in the officers’ club rooms. 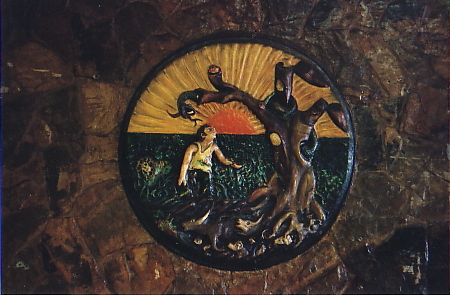 On a wall in the officers’ club rooms were a series of folk art style carved and painted round base reliefs. I’m don’t know what has happened to them. The escape proof Jika Jika Unit has been demolished along with the art on its walls. Prisoners had painted some of the yard walls of the Jika Jika unit. On the ceiling and walls of one cell an unknown, probably aboriginal artist had painted goanna with tracks leading up the wall and onto the ceiling. 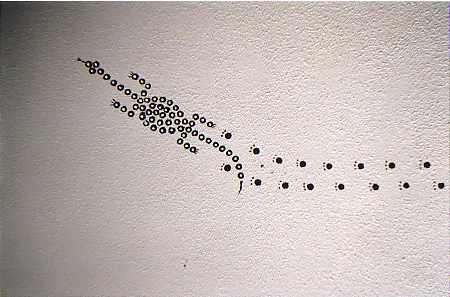 The simple elegance of this design helped humanized a dehumanising cell. Towards the end of its long life Pentridge Prison did have various art programs for prisoners run by art educator, Dr Max Darby and painter, Margaret Miles. (See Dr Max Darby’s “My Days In Prison”. )There was also at least one prisoner art exhibition in a CBD bank – so if anyone knows anymore details about prisoner art in Pentridge Prison please comment before the details are lost to history and redevelopment. This entry was posted on Monday, July 18th, 2011 at 4:52 PM	and tagged with aboriginal art, aboriginal artist, Coburg, folk art, mural, Pentridge Prison, prison art and posted in Art History, Coburg, Culture Notes. You can follow any responses to this entry through the RSS 2.0 feed. The art programs run by Max Darby at Pentridge Prison were primarily for students taking VCE studies. The sessions were designed to help in the student’s folio preparation and examination preparation. Some additional free sessions were taken for other students who might have wanted to study VCE Art in future years. Most were just people seriously interested in doing something of value to themselves. Many works were paintings that showed the understandable frustration and angst of being incarcerated with little hope for the future. I know, because I’m that Max. Dr. Max Darby, Arts Education Consultant. Thanks for the details Max. In 2014, I found three Ronald Bull paintings for $4 each in an Edithvale op-shop. The two oils depicting a river scene seem to be of the same location but are painted in completely different tones. I’ve heard that he was imprisoned on several occasions but been unable to find anything about why. Is anyone able to offer any information? Hi Mark, 20 years ago, I had a program on commercial radio here in MLB in which I covered William Stanford’s story and his fountain, I relying much on Prout & Feely’s book and council’s records. On having discovered your website, I intend on making further enquiries regarding the unfortunate Bull’s life which, if fruitful, I will be happy to share with you. Stanford’s story is fascinating because it is the other side of the coin to Charles Summers story. I would be very interested in finding more about Bull’s life and I will also try because I am interested in doing more research on artists associated with Pentridge. Other notable artists who also happened to be prisoners with a fascinating biography were Samuel Thomas GILL (1818-80) for street offences, Knut Geelmuyden BULL (1811-89) for forgery, William Alfred CLARSON (1852-1903) for bigamy, William Buelow GOULD (1801-53) robbery with force. CLARSON was born in Wolverhampton, UK, in 1852, he arriving with his parents aboard the Caroline Chisholm at Melbourne in May 1853, (Index to Unassisted Inward Passenger Lists to Victoria 1852-1923, http://proarchives.imagineering.com.au/index_search.asp?searchid=23). His mother died of dysentery in March 1854 upon which his father, the highly successful, notable Melbourne printer, William CLARSON Sr, married Caroline STABBACK in June 1855. To distinguish him from his father who was also called William Alfred CLARSON, young CLARSON was known by his second name, Alfred. Records show that at age 15, he joined his father’s printing firm, Clarson, Massina & Co, (“First Ninety Years, the printing house of Massina”, by Ronald G Campbell [Rex Grayson, his pen name], Melbourne, 1949). During 1865-66, he was a student at Scotch in Melbourne, however, at the surprisingly young age of 19, he was attached to a scientific party that journeyed to Cape Sidmouth in far north Queensland to observe a total eclipse of the sun, the expedition having been organised by the Government Astronomers of Victoria & NSW. As there is no record that he was unusually interested in astronomy, was this a youthful chance for adventure or was he perhaps an unruly lad who was getting in the way at his father’s prosperous business? At the 1872 Victorian Exhibition when he was aged just 20, his address was listed as 72 Lt Collins Street, Melbourne when he entered a water colour entitled Eastern End of Dandenong Ranges. That watercolour still seems to exist, it having been bought and sold repeatedly since but I unfortunately haven’t been able to locate an image of it. That same year provided a highly unwelcome surprise for the CLARSON family in that his stepmother, Mrs CLARSON-STABBACK, was brought before the Melbourne court in relation to her having had a highly publicised affair with Dr John BLAIR, indeed, so great was the scandal that the CLARSON family quit Melbourne for the UK and did not return until the dust had settled five years later, (“The Argus”, February and March 1872). In 1879, CLARSON was recorded as living in Pitt Street, Sydney, when he entered an oil painting entitled Still Life in the Sydney International Exhibition. The year 1881 saw the commencement of a sequence of unhappy events in his life which seem to indicate a troubled man, it being reported that he had been found after having vanished three or four months earlier following a trip in outback Queensland, (“Brisbane Courier”, 19 January 1881, page 3), his father locating him on Russell Island just off the coast of Brisbane. Alfred’s troubles were not yet over when, for whatever reason, he married at Sydney, Martha PAYNE in December 1881, and within two weeks, also married Susan PARKINSON whom he quietly abandoned for his first wife to fulfil a teaching post on Lord Howe Island where he was arrested four months later, (Thomas Bryant Wilson, – Diary written at Lord Howe Island, 1882, online at http://image.sl.nsw.gov.au/Ebind/safe1_10/a1158/a1158169.html)). Convicted of bigamy a month later, he was sentenced to four years imprisonment “with hard labour on the roads” which he served at Berrima jail, prison records describing him as being, “5’8″ tall, 134 pounds with brown hair and blue eyes” (Index to Goal Photographs, http://srwww.records.nsw.gov.au/indexes/keyname_search.asp). On being released after fully serving his sentence during which time his first wife had divorced him, he remarried his second wife in 1886 by whom he subsequently had two sons, Arthur and Sidney, (NSW Marriage & Birth Certificates). By 1888, CLARSON seems to have set his problems aside to have become an established artist, his most notable work being a lithograph drawn from a hot air balloon over Brisbane which shown a perfectly executed panoramic landscape of that town, the first ever, from which many of the buildings were readily identifiable, (http://catalogue.nla.gov.au/). This lithograph was offered for sale on the internet in 2001 for $6,000, it being described as, “Signed and dated in the plate lower left ‘W.A. Clarson 1888’. Pale foxing, very good condition. Rare.” CLARSON specialised in sketches drawn from hot air balloons, indeed, he had redeemed himself to such an extent that he was appointed as the inaugural First Secretary of the Royal NSW Art Society. He died in Queensland in 1903, (Queensland Government index to births, deaths and marriages, https://www.bdm.qld.gov.au/IndexSearch/BirIndexQry.m), and was survived by his son Sidney CLARSON, who was also an artist. As a melancholy footnote, his father, the printer who’d been a very wealthy man of considerable standing in Melbourne’s business community, later fell on hard times. After successfully locating his son in Queensland, he returned to the Victoria Riverina where he’d attempted to take up fruit farming. After such an interesting life, he became depressed, he alone on his farm one morning blew his brains out with a firearm.